That’s a good question, I always think of when blood gets out into the open air, that it just goes bad pretty quickly. And like the scene in American Horror Story or the story of Bloody Countess Elizabeth Bathory: straight from the source, into a bowl or a tub… that will coagulate pretty fast. Platelet Rich Plasma (PRP) or Platelet Rich Firbrin (PRF) procedures must be done by a Doctor and a nurse. It has been used for many years if different hospital settings for bone and skin regrowth. Platelet gel and Fibrin sealant, derived from PRP mixed with Thrombin and Calcium chloride, have been exogenously applied to tissues to promote Wound healing, Bone growth, Hemostasis, and Tissue sealing. The plasma that is collected from the PRP treatment contains a lot of growth promoting and healing properties which can can be used to encourage our body to rejuvenate itself. So you never have to worry about contracting anything, because this procedure uses your own blood. The growth factors in the plasma stimulates collagen and keratin production. Collagen is the main protein that keeps skin plump and young looking. As we age our collagen diminishes resulting in less elastin in our skin as well as thinning. By encouraging collagen back into our skin we can see a return to younger skin. I have read 2 different procedures all pretty much the same but one seems more painful then the other. The average Price: $1,100. From reading different doctors have different steps they take but the main fact for the Facial uses the micropen and the Facelift injects directly using one standard syringe (just the same as botox or collagen injections). All begin with a cleanse, some add microdermabrasion in this step as well. Then they use a numbing cream onto your skin. During this time they are also drawing your 1-3 viles of blood. This is the same amount that you would have taken for any regular blood test at the GP’s office. This depends on what additive they are using. There are apparently about 10 different ones that doctors can use, some are called SELPHY, or Harvest. Some at this step add botox or collagen shots as well for extra effects. The nurse is spinning the viles of blood in the centrifuge to separate the blood cells from the platelets. Facial: the doctor will go over your face with the microneedle, then will spread the PRP mixture into your skin. Depending on your pain threshold and the doctors discretion this might happen once or twice more. 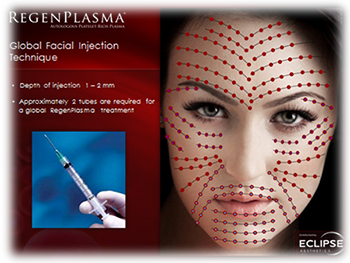 Facelift: the doctor will follow the mapping below to inject the PRP into your face. Last is cleansing your face and being sent home with some plasma left and aftercare. This is where some people may notice swelling, bruising, bleeding but it only requires a few hours to a day to recover. It does take about 4-6 weeks for full effect, and about a week to stop peeling and full swelling to go down. Many people expect to look like Kim Kardashian at the end but from what I have read, most don’t. You don’t really see the red blood, or end up bloody like Carrie. So from what I have read all about the extended use for PRP/PRF in the medical field before the use in cosmetic surgery I feel confident that the Vampire Facial is a worthy investment in comparison to Placenta facials.